It’s been a busy few weeks here at Broadway Sessions headquarters planning for the next six months. It’s very cool for us that after only two Sessions this event has gained so much momentum here in little old Adelaide. As we look to the future though, we’ve found the need to start expanding the team. So, we are very excited to introduce our new media partner who will be coming on this journey with us. 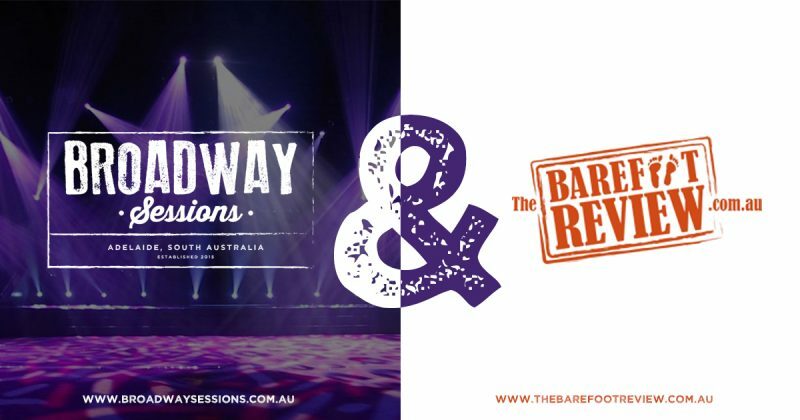 You have most likely seen The Barefoot Review’s name on social media and attached to musical theatre reviews; but don’t stress, they won’t be reviewing the performances each Session – in fact, we have declared Broadway Sessions a review free event! They will, however, be helping with increasing exposure for our Sessions through advertising and news stories on their website. This will help us ensure that every Session is as big, if not bigger, than the last. The Barefoot Review has been around since 2007 and is all about quality over quantity. Everything they write is supported by a solid understanding of the craft, an industry qualification, and/or by years of experience in both the artistic genre and the written word. This makes it the publication of choice for many readers looking for a balanced and objective critique. Barefoot supports the arts in South Australia through previews, news and reviews, all while maintaining a truly local vibe with a focus on creating professional and balanced content. They also provide general coverage for some of Australia’s, largest festivals and events. Broadway Sessions is thrilled to welcome Paul and the Barefoot team to the stage. If you’re interested, you can learn more about them at www.thebarefootreview.com.au.